We sat in an island of rubberized flooring, amidst faded tiling, bathed in harsh fluorescent lighting. I was bent at the waist, untying a well-worn pair of rental ice skates. â€œKra-tok-vee-layâ€ he said in a voice, so sure and comfortable with this language I had never heard before. Itâ€™s strange to have someone youâ€™ve just met teach you how to pronounce your last name. My anglicized, but originally Czech last name has been both a humorous way to torment telemarketers and a source of awkward first-time roll calls. However, it wasnâ€™t until this moment that I knew its intended pronunciation. My relationship with Czech culture prior to this point was very limited. Czech blood may have coursed through my family’s veins, but that never led any of us to actually learn about our heritage or even think about it. I knew that the country was no longer Czechoslovakia, but now the Czech Republic, which I suppose might be more than most third graders, but nevertheless, I really didnâ€™t know where my name came from. That was, until I met Petr Barna, his wife Andrea BarnovÃ¡ and their daughter, Sofie (who, by Czech custom, take the ending “ovÃ¡” at the end of their father’s or husband’s name). 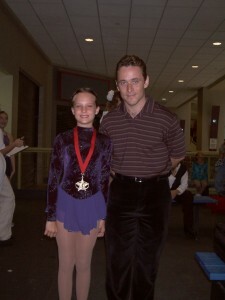 By chance, during one of my early group figure skating lessons at the local mall, Petr was a substitute coach. Soon after, the man who taught my family and I how to say our name became the man who taught me how to skate. Andrea and Petr became my coaches and Sofie became a training partner. But they were much more than that. Throughout the years, it became normal to listen to Petr and Andrea converse in Czech during our hour-long car rides to and from the rink each day. Skating practices became my daily escape from the stresses of school. I could go to the rink and forget anything else previously on my mind, just focusing on skating. I started in elementary school, and grew to love it so much I haven’t stopped yet. Our friendship transcended practices. During dinners, every once and a while Andrea would prepare okurkovÃ½ salÃ¡t (cucumber salad), or chlebicky (sandwiches), or houskove knedliky (bread dumplings), which was my limited encounter with Czech food. She would often tell my sister and I what it was, though I admittedly had to look up these words to write this. I suppose, for my younger self as an elementary-middle school student, knowing what I was eating was much less important than actually eating it. Before the families sitting around the table took a drink, â€œnaz dravÃ­â€ was declared, with my dad butchering the language, endearingly. When I was in ninth grade, my family and I even got to see these meals in their natural environment. We went to visit the capital, Prague, and Olomouc, a smaller town in the Moravian region. There, we also got to experience a Czech Christmas or VÃ¡noce with the Barnas and their family that still live in the Czech Republic. The Barnas and I have since left our respective homes in Florida. I moved to Evanston for school and they moved to Switzerland. Even though we are now separated by about nine hours of plane rides, I still consider them a second family. I grew up with them â€“ at some points spent more time with them than my actual family â€“ and they taught me not only about skating but a lot about myself as well. I’m a mixture of many different nationalities, but the one to which I now feel most attached is Czech.